SACRAMENTO -- Governor Jerry Brown last week signed legislation to provide free menstrual products in bathrooms at Title 1-funded (low income) schools. The bill, authored by Assemblymember Cristina Garcia (D-Bell Gardens) received bipartisan support in both the Assembly and Senate. 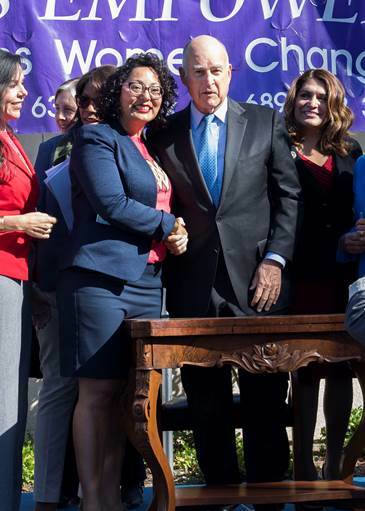 “By signing this bill the Governor is sending a clear message that California values and respects all aspects of a woman’s health and education,” said Garcia, who is also the chair of the California Legislative Women’s Caucus. "Menstrual products are medical necessities and it is important we recognize not having access to these products impacts a young girl’s education. I’ve heard stories from many young girls that struggle with their period on a monthly basis, affecting their schooling, morale, and health." Many young girls will miss 3 to 5 days of school each month because they don’t have access to these basic medical necessities, according to a press release from Garcia's office. Some girls expose themselves to serious illness when they try to make the products last longer or improvise products to absorb their periods using all types of materials that are medically unsafe. "This bill will help break down barriers in education and begin to address the stigmas many young girls struggled with due to their periods," added Garcia. "The young girls that shared their life stories of hardship, the various groups that advocated on behalf of the bill, my colleagues on both sides of the aisle and the Governor are to be commended for passage of this bill." Last year New York City ran a pilot program installing tampon and pad dispensers in 25 of its schools. The outcome showed an increase in attendance. In August, Illinois passed legislation to provide menstrual products in all schools grade 6th-12th.